The story of the economy has been akin to a Cadillac meeting a series of jolting potholes. It’s an uncomfortable ride, but the vehicle continues to progress, and it’s not clear whether or not any of the road imperfections are producing lasting damage. If one were to spend one’s time watching the news, they would be pounded by news of chemical warfare, late-night bombings, tariffs on steel and aluminum, a burgeoning trade war between the world’s two largest economies, frequent terrorist attacks, domestic investigations, and a general landscape of turmoil. This deluge of unsettling news would appear to be enough to soften economic performance. But to date, there’s little evidence that all this negativity has done much damage to the economy. Here’s what we know as of early spring 2018. Even with all the ups and downs recently, the U.S. economy has added jobs for an incredible 90 months. This is an unprecedented winning streak. On top of that, since employment bottomed out in February 2010, the nation has added approximately 18.7 million new jobs. As of April 2018, total U.S. nonfarm employment was 148,424,000, with 164,000 net new jobs added that month. 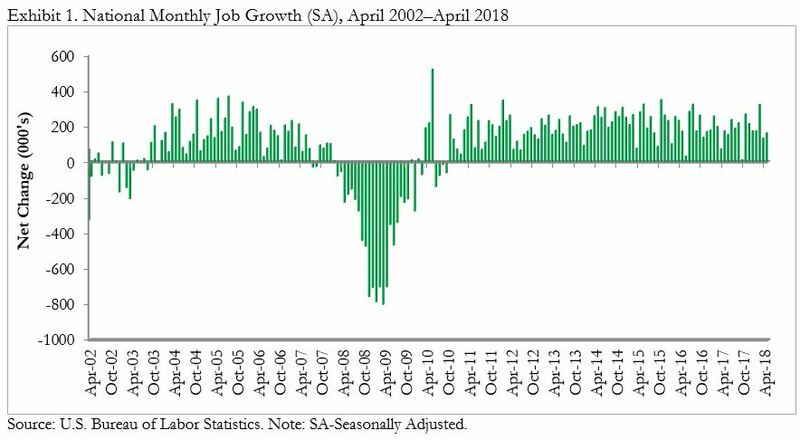 Unemployment declined in April 2018 to 3.9 percent, the first time since December 2000 that unemployment has been below the 4 percent threshold. However, unemployment has declined recently in part due to a shrinking labor force participation rate, which as of this writing stands at a lackluster 62.8 percent. Recent declines in labor force participation are unnerving. With America boasting a record 6.55 million available job openings, labor force participation should be rising. The fact that labor force participation has been declining strongly suggests that human capital shortages will continue to worsen, and that implies faster wage growth (fine), more inflation (not so good), and higher interest rates (problematic for many). Average hourly earnings for all private nonfarm employees rose 4 cents in April, from $26.80 to $26.84. Over the last twelve months, average hourly earnings rose by 2.6 percent (67 cents). This dynamic of rising wages, inflation, and interest rates may be the one that will ultimately undo the current economic expansion, now on the verge of beginning its 10th year. Higher interest rates are not good for many asset prices, including the inflated asset prices of stocks, bonds, and commercial real estate. Inflation is emerging from a number of sources, including apartment rents, home prices, gasoline, steel, aluminum, softwood lumber, healthcare, tuition, and of course rising borrowing costs. For now, the U.S. economic expansion remains firmly in place, with a combination of momentum, tax cuts, global money supply, and confidence propelling the U.S. economy forward. America’s economy expanded 2.3 percent last year after growing 1.5 percent the previous year. The International Monetary Fund forecasts American growth at 2.9 percent this year. Economic headwinds are building. However, a combination of recently enacted tax cuts, consumer and business confidence, positive wealth effects attributable to the performance of financial and housing markets, a stronger global economy, and accommodative global monetary policy should position 2018 to be the best year for economic performance in America since 2005. Thereafter, risks may expand. The Federal Reserve will continue to push rates higher as inflation becomes increasingly apparent. 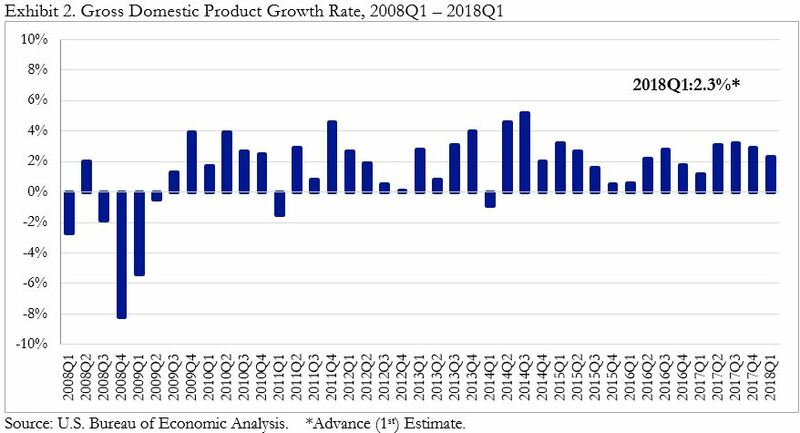 The fragility of the U.S. economic expansion will increase in 2019 and Sage continues to forecast a recession around 2020/2021 along with many other forecasters. Please remember that past performance may not be indicative of future results. Different types of investments involve varying degrees of risk, and there can be no assurance that the future performance of any specific investment, investment strategy, or product (including the investments and/or investment strategies recommended or undertaken by Lowe Wealth Advisors, LLC (“Lowe”), or any non-investment related content, made reference to directly or indirectly in this newsletter will be profitable, equal any corresponding indicated historical performance level(s), be suitable for your portfolio or individual situation, or prove successful. Due to various factors, including changing market conditions and/or applicable laws, the content may no longer be reflective of current opinions or positions. Moreover, you should not assume that any discussion or information contained in this newsletter serves as the receipt of, or as a substitute for, personalized investment advice from Lowe. To the extent that a reader has any questions regarding the applicability of any specific issue discussed above to his/her individual situation, he/she is encouraged to consult with the professional advisor of his/her choosing. Lowe is neither a law firm nor a certified public accounting firm and no portion of the newsletter content should be construed as legal or accounting advice. A copy of the Lowe’s current written disclosure Brochure discussing our advisory services and fees is available upon request. If you are a Lowe client, please remember to contact Lowe, in writing, if there are any changes in your personal/financial situation or investment objectives for the purpose of reviewing/evaluating/revising our previous recommendations and/or services, or if you would like to impose, add, or to modify any reasonable restrictions to our investment advisory services.